I’m known for my late night cookie creations (sometimes with the help of Son) as well as creating something wonderful within the limitations of ingredients I have on hand. 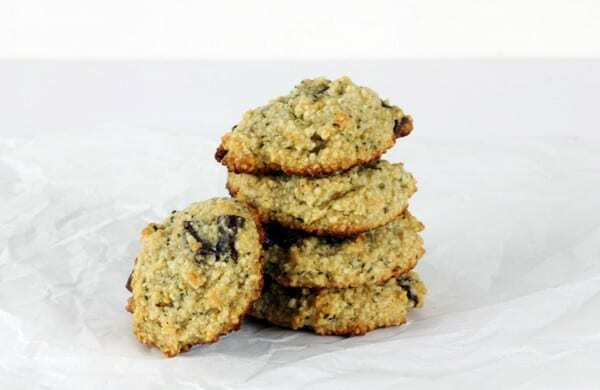 These Hemplicious Paleo Chocolate Chip Cookies are the latest example of both. I love these cookies with their “nuttiness” and extra protein boost of hemp seeds! I set out to make my Toasted Coconut Chocolate Chip “Samoa Taste” Cookies, but quickly discovered that I did not have any shredded coconut on hand. I knew I was not looking for a really sweet treat and Andrea’s Chocolate Hemp Protein Muffins from March Muffin Madness suddenly came to mind. Next thing I knew I was replacing the shredded coconut with hemp seeds and adding an egg to the recipe. Plus, I left out the coconut sugar because I decided the honey would provide more than enough sweetness. I was right. The resulting cookie dough was soft so I dropped the dough onto the baking sheets instead of rolling it into balls as I’d done with the original recipe. As with the original recipe, these cookies seem underdone when removed from the oven, but they continue setting up as they bake on the baking sheet. These cookies are soft, nutty, and have the perfect balance of cookie base and chocolate chips. Hemp seeds and dark chocolate chips are an ideal combination in my opinion. These Paleo Hemplicious Chocolate Chip cookies are full of grain-free goodness from ingredients like almond flour, hemp seeds, coconut flour, and honey, and taste really good, too! They make me happy. I hope they’ll make you happy, too! Oh, and let me add that they’ve already made one blogger friend happy. I shared the recipe with Johnna of In Johnna’s Kitchen and she immediately made these cookies, loved them, and shared her photos with me. Woohoo—thank you, Johnna! Preheat oven to 350F degrees. Line two baking sheets with parchment paper. Add egg to large mixing bowl beating slightly. Add in remaining ingredients except chocolate chips mixing all until incorporated. I use a wooden spoon for the mixing; that’s all that’s needed. Drop batter by tablespoonful onto the parchment lined-baking sheet. Bake for about 8 minutes or so. Outer edges should be brown, and middles should be non-glossy, but not very brown. Cool on baking sheets for 10 minutes. Cookies will continue baking/setting up during this time, so do not skip this step. Remove from baking sheet to wire rack or serving plate to cool additionally as needed. Makes about 15 cookies 2 ½ inches in diameter. I always scoop and semi pack my almond flour in the cup, so I’m sure to get the same measurement each time.Store on an open plate or an open container. Do not put in a closed container as these cookies will soften too much. Originally published April 26, 2016; updated August 26, 2018. The sign of a good cook/baker is that you can take what you have and turn it into a wonderful creation! These cookies look so delicious and healthy! What a treat! I have all of these ingredients! We’ll have to make cookies as part of our math classes today. 🙂 Thanks!! Thanks, Cassidy! They are a bit pricey, but I find that a bag lasts me a very long time and gives me a wonderful protein to add to smoothies and so many other recipes. For example, I absolutely love hemp seeds in the Best Ever Salmon Cakes recipe on gfe. And now I love them in these cookies. 🙂 I think they’d be a great addition to your grain-free cooking ingredients! Thank you, Angela! Oh, you are so right on baking and rainy days going together. 🙂 Comfort cooking at its best IMHO. Hope you enjoy these, dear! 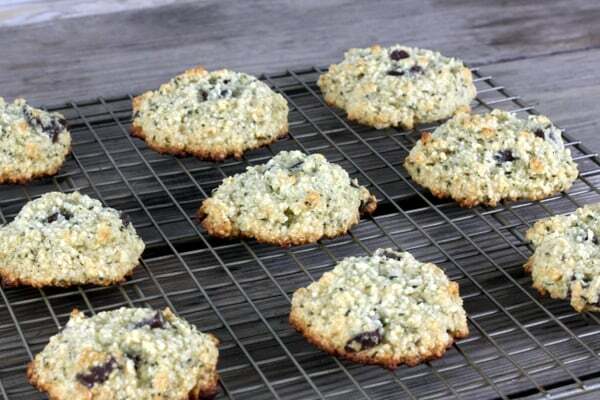 I have been wanting to try some new ways to cook/bake with hemp seeds and these look delicious! Thank you! These look very delicious Shirley and how lovely of Johnna to share the photos. I haven’t cooked with hemp seeds before mainly because they’re a bit expensive but I know they’re an excellent source of plant based omega 3 so we’ve been considering buying some. Vicky–I agree that they are expensive, but I’ve never once regretted buying them. A little goes a long way. 🙂 Yes, Johnna is a dear to share her lovely photos. These cookies weren’t being photogenic for me at all, so she truly saved me!! Can’t wait to try these! I always keep hemp heart around for nutritional boost to recipes….so I love that this one uses 3/4 cup!! well, we DID love them!! Great recipe Shirley, I know we will make these again with all that protein, omegas, and fiber from the hemp!! You and Johnna are a great team! Beautiful pictures and delicious recipe. I love hemp but have never tried baking with it (obviously not lately since my oven was dormant for 2 years). Sounds nutty and delicious. And such pure ingredients! Thanks, Heather! We have made a good team on quite a few projects, but this might be my favorite. 😉 Now you’re making me think that I need to make another no-bake version of these treats! These are truely spectacular! I’ve found they have a much more complex flavor if you bake them in a pit fire (AFTER YOU TAKE THE BEEF OUT!!!). Those look delicious Shirley and Johnna! One can never have too many chocolate chip cookies, especially when they’re healthy. 😉 Thanks so much for sharing them at Savoring Saturdays! I’ve shared these on our Hearth and Soul Hop FB page, Shirley. Love all the protein they contain – and they sound so delicious too! Thank you for being a part of our Hearth and Soul Hop. Thank you, April! I’m so pleased that so many have already made these cookies and loved them. Win, win!! I always look forward to Hearth and Soul Hop–so much variety, so much goodness. Thank you for hosting each week!